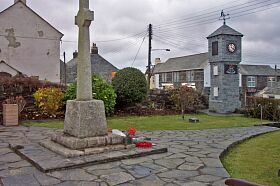 Delabole war memorial garden is located off High Street. A war memorial garden off High Street, Delabole comprises a shrub border, with grass surrounding the paved memorial area. The garden is accessed off High Street, up a sloped slate path which leads to an area, roughly triangular in shape, also of slate, with the centrepiece being a roughly hewn granite war memorial (MCO56287). The garden was officially opened on 11th February 1992 by Sir George Croydon Marks M.P. In the eastern corner of the garden is a clock tower (Published in The Delabole Slate issue 311 (1). Extracts taken from an article in The Cornish and Devon Post, 22nd February 1922, Ray Warden).